The countdown has begun to the reissue of the year. 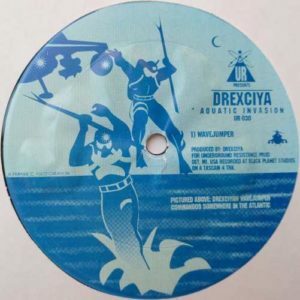 “Journey of the Deep Sea Dweller”, the first in Drexciya’s retrospective, is brought to us by Clone Classic Cuts in December 2011. Those in possession of hard-to-find original EPs might be irritated about this mission scrapping the back catalogue’s collector value , but I think Clone is doing a great favour to the community in sharing the legacy of Detroit’s ingenious electro act. In anticipation, it’s good to recall “Aquatic Invasion” from 1995, which could be Drexciya’s most electrifying assault. Two excellent cuts of pit bull electro: in “The Countdown Has Begun” one can’t escape hammering analog rudity, spiced up with gloomy proclamations. “Wavejumper” is an anthem to a legion of immortal frogmen combating the waves of the Atlantic. Somewhat calmer notes for the end, when we resurface to the sun in “Sighting The Abyss”. The EP is from the harder end of Drexciya’s productions having some common features with their L.A.M. (Life After Mutation) project on Detroit’s Hardwax. A real treasure by deep sea dwellers.